The DCWV Inc. booth was the one that impressed me the most! Look at all these fabulous dresses all made in paper - Gorgeous art! Each and every dress has so many fantastic details. We were told that the designers have been working for months on these creations - I belive that! Wow these are amazing! Thanks for sharing, Sanne! Those dresses were mind-boggling...gorgeous couture fashion made with paper, who knew?!! WOW - a real labor of love!! 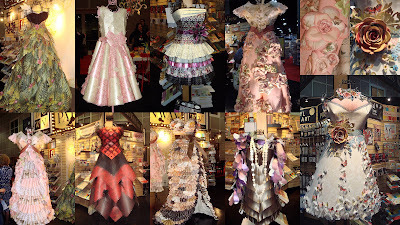 Fabulous dresses Sannem amazing that they are made of paper!! Her sidder jeg med åben mund og polypper. Hvor må det have været en kæmpe oplevelse og tænk med så meget Scrap. Det er et imponerende syn med de smukke kjoler. Tænk at kunne lave sådan et projekt. Tak for jeg måtte kigge med. these are amazing! must be stunning in person! thanks for sharing, Sanne!